A major bushfire in Western Australia has destroyed nearly 100 homes and left three people unaccounted for, emergency officials say. The fire, which had already razed 53,000 hectares of land this week, struck Yarloop, asmall rural town south of Perth,on Thursday night. 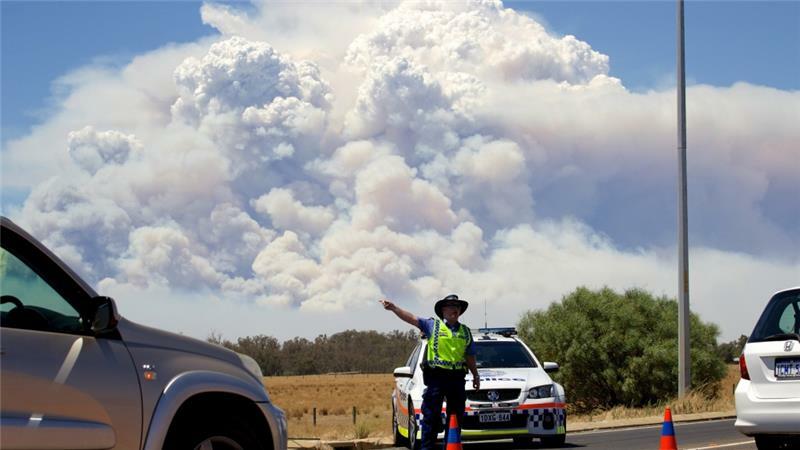 "I believe we've had what I would suggest are catastrophic losses within Yarloop," Wayne Gregson, Western Australian fire and emergency services commissioner, said on Friday. Local media reported that 95 homes were destroyed,together with the post office, shops and the fire station,in the town which has a population ofonly 545. "It just got out of control ... after that it just ripped through, it was quite scary," Jesse Puccio, a volunteer firefighter, told the Australian Broadcasting Corporation. Aerial footage showed houses reduced to just their brick fireplaces, leaving only blackened ground and the burned-out shells of vehicles. Ron Sackville, a Yarloop resident, told 6PR radio there was "very little" left. "I look around 360 degrees and everything is burned to a cinder. The fire was horrendous," he said. Another resident described the overnight emergency - initially triggered by a lightning strike - as like the town being hit by "fireballs". "It's devastating," he told theAustralian Broadcasting Corporation. "The hall is gone. I believe the pub's gone. The workshops are gone. The old hospital is gone. I think the church is gone." The bushfire in Western Australian is the latest in a series of fires that have razed parts of the country amid sustained hot and dry weather. Four people were killed in a series of bushfires sparked by lightning in Western Australia last November.More than 100 homeswere destroyed in fires on Christmas Day in Victoria, while two people were killed in South Australia. Wildfires are an annual summer event in Australia but rising temperatures have prompted some scientists to warn that climate change could increase the length and intensity of the summer fire season. Australia experienced its fifth hottest year on record in 2015, according to the Bureau of Meteorology, which has been keeping statistics since 1910.